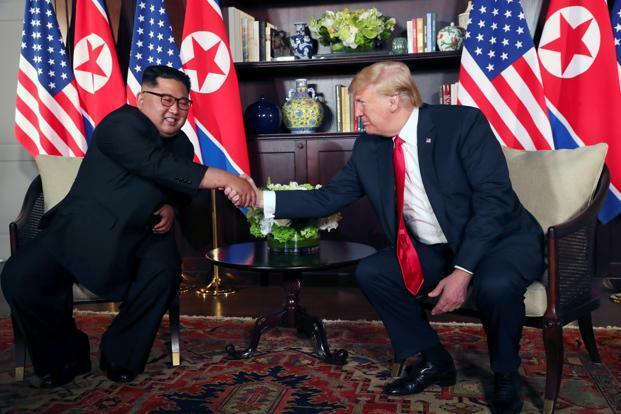 Toronto, February 28: US President Donald Trump and North Korea’s leader Kim Jong-Un started off the second summit in Hanoi, Vietnam with a genial handshake and grandiose compliments. The duo then moved on to the dinner table at which they were accompanied by US Secretary of State Mike Pompeo, acting chief of staff Mick Mulvaney along with Kim Yong Chol, vice chairman of the Central Committee of the Workers’ Party of Korea, and Ri Yong Ho, the minister of foreign affairs, joined Kim. The duo will meet for marathon sessions on Thursday as Trump tries again to get North Korea to denuclearise while Kim Jong-un would like some relief from the economic sanctions. Just days ahead of the summit, Trump Administration officials acknowledged they were still working to come to a “shared” understanding on the matter. It remains to be seen if the two sides manage to come to an agreement on what ‘complete denuclearisation’ would mean for North Korea and how to get there.